Progress on the New Student Centre is underway with the recent demolition of the Node staircase adjacent to the Bloomsbury Theatre marking completion of the first phase of works. The next stage is due to start shortly and as part of this the Gordon Street entrance to the central campus will soon be closing. All pedestrian access will be closed from this Tuesday (12 July) until the project completes in December 2018 and there will be no through route for regular deliveries. The project team has looked closely at the options for access and given a lot of consideration to the closure. The team has spoken to those who use this entrance regularly including Library Services, Room Bookings, Bernard Katz and the Advanced Centre for Biochemical Engineering (ACBE) as well as others who use the immediate and surrounding site. "We appreciate this closure will be an inconvenience and may add to your journey times. However, we are committed to meeting health and safety standards and ensuring the wellbeing of all those on and around the site. By re-routing pedestrians we can best guarantee the comfort and safety of staff, students and the wider university community. We have mapped out some alternative routes for getting around and this information will soon be available online and shown on signs around the site." The New Student Centre is at the heart of UCL's vision to make this the most exciting university in the world to study and work at. The Centre will provide students with approximately 1,000 study spaces, student enquiry services, a café, IT clusters and areas for both social and quiet study. It will be built across two floors going down and four above ground level and include a roof terrace and new ground floor landscaping and outside public space. "The New Student Centre is an example of UCL's commitment to students and it will provide outstanding facilities that enhance the student experience. As the main works get underway there will be some impact on our day to day routines. We are doing our best to minimise this and we will continue to keep you up to date on the project progress. If anyone has any questions they can get in touch with the site team." 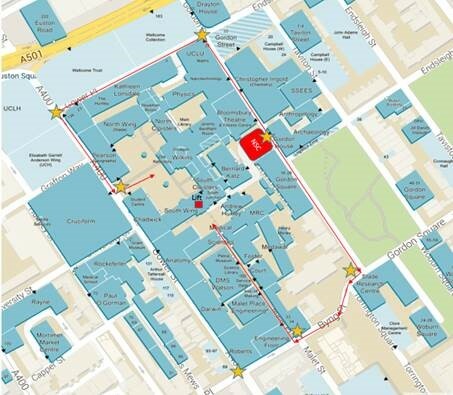 The red arrows on this map show alternative routes for staff and students on to central campus once the Gordon St entrance is closed. The accessible routes into campus will be the same as the routes indicated here. There is a lift within the South Wing that people can use for the level change if entering through the Front Quad. If you need to speak to someone about the New Student Centre you can contact the site team 24/7 via our helpline: 08456 025 761 quoting 32927.